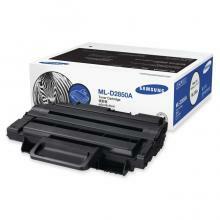 Introduced in 2007, the Samsung ML-2851ND is a monochrome laser printer built with small office use in mind. It offers better printing speeds and also provides more sophisticated printing options and a small enough footprint to make it viable for the individual, for the home network, or for the home office. 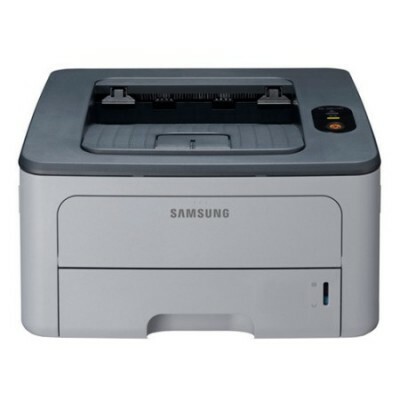 The printer measures 14.3" by 14.5" by 8.3", which makes it slightly larger than other Samsung consumer laser printers but still much smaller than other industrial-grade ones. At 26.2 lbs it weighs significantly more than other Samsung units and other consumer printers, which often weigh between 10 and 15 pounds, but it's still easily transported. The printer will fit easily alongside other equipment, on a desk, in a cabinet, or upon a credenza. The printer produces up to 30 pages per minute processing letter paper and 28 pages per minute when printing to A4-sized sheets, well above the speeds offered by other consumer laser printers (often between 12 and 15 pages per minute) and comparable with industrial-grade printers from the early-to-mid 2000s. It has an input capacity of 250 sheets in its paper cassette and 1 sheet in its multi-purpose tray, an output capacity of 150 sheets, and supports printing to media sized between 3" by 5" and 8.5" by 14", as well as to transparencies, envelopes, labels, postcards, and card stock, if necessary. Automatic duplex printing is built-in, which this printer's predecessors never before offered. Documents print at an effective resolution of 1200 by 1200 dpi, consistent with other laser printers from around this time period. If necessary, the printer's paper capacity can be increased to 501 sheets by adding another 250-sheet cassette tray, making this printer even more viable for potential office use. 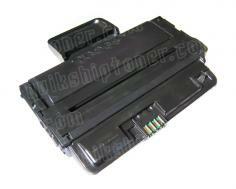 The printer includes 32MB of RAM, which can be expanded through a 128MB module to 160MB. Other printers in Samsung's ML line were limited to either 8MB or 32MB with no opportunities for expansion, again putting this model at an advantage. The printer includes a USB 2.0 port and a 10/100 Base-TX Ethernet port to ensure compatibility with most systems. It also includes support, via emulation, for PostScript3, PCL6, Samsung Printer Language, IBM ProPrinter, and EPSON print languages, as well as drivers for all versions of Windows from 2000/XP onward, many flavors of Linux (support for Fedora Core, Mandrake, and SuSE are included in the built-in drivers), Mac OS 8 and 9, and Mac OS X 10.1 and onward. USB and Ethernet cables are not included with the printer. While this is not necessarily a long-term disadvantage, it is an inconvenience and something worth ensuring before purchasing and attempting to set up the printer. Though the ML-2851ND is closer to a small office or printer than many of its lower-end laser printing peers in the ML line, it lacks more sophisticated finishing options available on higher-end office printers. Duplex printing is a many convenience, but stacking, stapling, and sorting systems as required by many offices are unavailable on this model. Paper jams, which can happen with some frequency when printing to lower-end thin recycled paper, require removal of the toner cartridge to resolve, potentially creating a major inconvenience and increased downtime as a consequence. Some users report that within 6 to 12 months of use, the printer sometimes develops unresolvable heat-related error messages. Repair is often unaffordable compared to the cost of replacement or impossible, making the printer difficult to consider as a long-term solution to your printing needs and more to be thought of as a "disposable" printer. Review it: "Samsung ML-2851ND "
The printer's standard-capacity toner cartridge is rated to produce 2000 sheets at 5% coverage. High yield cartridges are also available for this printer, which produce 5000 sheets at 5% coverage before requiring replacement. Toner cartridges for the ML-2851ND have a drum unit built in, which brings up the amount of waste produced by the printer, as well as the cost of replacement toner cartridge, but does reduce the amount of maintenance and downtime necessary in order to ensure normal printer function.